Shanna Legg, from Grangeville, Idaho, shot this nice 6×6 Whitetail Buck on the Killgore’s property up Deer Creek Rd near Riggins and White Bird, Idaho. The deer are in rut right now, as this buck was chasing after a doe early Wednesday morning. This buck is very unique with a split eyeguard on his left side, and a couple small kickers coming off the eyeguard on his right side. 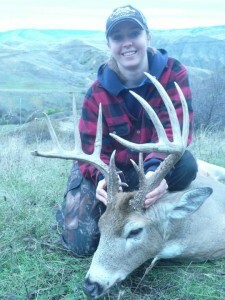 Shanna’s buck scores about 140.